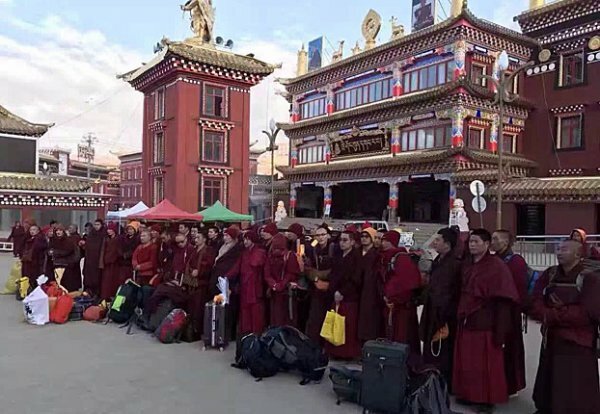 The mass evictions from Larung Gar in Sichuan province continue, with the Chinese authorities forcing Buddhist nuns and monks to sign a pledge promising never to come back. Beijing has vowed to reduce religious activity in Sichuan by dismantling the Larung Gar Buddhist Institute, one of the largest Buddhist teaching institutions in the world. Tragically, this most recent incident is but part of a Chinese authorities’ wider strategy of repression and follows increased state-sponsored brutality towards Buddhist monks in Tibet. As Chinese authorities continue to work to reduce the size of Sichuan’s Larung Gar Buddhist Institute, evicted monks and nuns are being forced before they leave to sign documents vowing never to come back, sources in the region say. “On Oct. 30 , over 400 monks and nuns from Golog [Guoluo] and 300 from Yulshul [Yushu], along with many others belonging to different places like Chungchu [Hongyuan], Gonjo [Gongjue], Ngaba [Aba], and Dzamthang [Rangtang], were forced to leave,” he said.